This is the official homepage of Full Time Artists™. We feature original graffiti art, music, commercial design, typefaces and more created by FTA and other featured artists & writers. We have been online, bringing you real graffiti goodness since 1997. Our galleries of graffiti photos, blackbook sketches, ink outlines, tags, throwies, characters, street art, stencils, digital & custom graffiti & other artwork are all free to view with no sign up. Most of the artwork shown on this site can only be found here where it has been published directly by the artists. The FTA collective includes graffiti writers & artists, musicians, emcees & producers, designers, dj's & dancers, videographers, letterists, web designers and more. We are happy to have provided original artwork for everyone from the simplest independent business to some of the biggest names & in a whole list of industries. Available Now from Full Time Artists™. Check out www.graffitifonts.net/burn to see what's included. Full Time Artists - San Jose California & worldwide since 1991. Thousands of graffiti photos, sketches, tags, pieces, blackbook pages , outlines & more by FTA and other artists. Graffiti canvases, prints, spraypaint, acrylic, ink, etchings & other hangable artwork. Custom Logos, Lettering, Graphics, Websites, and more from Full Time Artists. 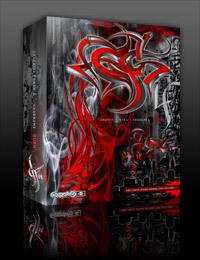 The original & official Graffiti Fonts collection was created by Full Time Artists in 1999. Our fonts are all shown here. Exclusive, Royalty Free Vector Graffiti, Tattoo & Street Art. Scaleable vectors, images, photo cut-outs & more. Exclusive, Royalty Free Stock Images featuring walls, paint, smoke, textures, trains, clouds & other useful imagery. Highground Industries was launched by FTA in 1996. Discography, audio, downloads & more are featured here. This site sells, graffiti art, graffiti fonts, canvases & prints, caps, music, clothing & more from Full Time Artists. Full Time Artists works with business of all types to develop brands & web assets. With custom art & design.